We tend only to want to eat fruits and vegetables that have the perfect shape and color. But did you know that fruits and vegetables don’t always grow into perfect shapes? And yet, they could still taste fine and be eaten. Since farms know that people probably won’t buy “imperfect” produce, those fruits and vegetables usually don’t even make it off the farm—they just get tossed. Perfectly good food gets thrown away all the time just because of how it looks. Hopefully, if you had a chance, you’d give eating them a try! 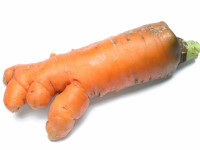 Check out this campaign by EndFoodWaste.org for saving ugly fruits and vegetables! Their motto is “Because all produce should be loved and eaten, not wasted!” Campaign founder, Jordan Figueiredo, was also featured in this recent Waste Dive post.